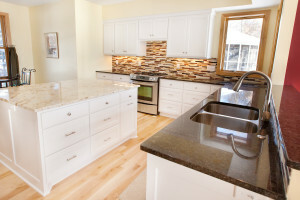 Your kitchen is often the biggest selling point of your home. Ensure you make an impression, and increase the overall value of your house, by increasing your kitchen’s form and function. One of the best, and often most economical, ways to do this is to add a custom kitchen island. The biggest benefit of a kitchen island is that it adds often-needed storage space. And the glory of having a custom cabinet maker build your island for you is that you can design the island to fit your particular needs. You can choose items such as pull-out drawers, glass-faced cabinet doors and built-in bookshelves for your cookbooks. You can also move items to your island, such as your stove or prep sink, which can allow you to repurpose the rest of your kitchen to make it function better. There’s no getting around it—the kitchen is the hub of activity during most Minnesota gatherings. Guests and family members love to congregate here while they wait for their meals. Make the best use of your custom kitchen island by building in extra seating. This can come in the form of a breakfast bar with stools or even a built-in bench. That way, there’s a space for everyone to sit. It also guarantees the chef can work in the kitchen without stepping on guests’ toes. 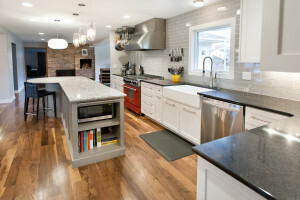 One of the greatest things about adding an island, whether during a full kitchen remodel or as a quick renovation project, is that you get to add a new pop of personality. The design options are endless here, as you can bring in new design features that complement your already-existing space. By going custom, you are able to choose what type of statement you want to create. For instance, your builder can design an island’s shape and size to flow naturally with your space. Or, you can do something that really stands out and becomes the talking piece of all who enter, such as this island aquarium. What Favorite Functionality Would You Add to Your Custom Kitchen Island? Do you have a kitchen island? How do you use it? Or, are you planning a kitchen renovation soon? What are your goals for your new kitchen island? Share your thoughts with us! 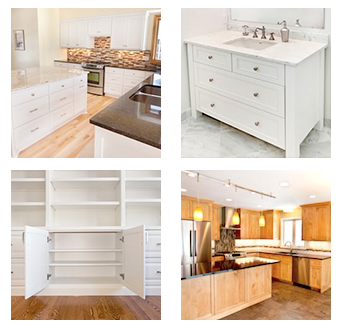 You can either call us at 952-737-7088 or send our custom kitchen cabinet company an email. We also welcome your comments on our Facebook page.